It is the second to Last Upcycled Awesome Linky Party! Are you sad? Yeah mee too, it's been fun, but better things are coming your way so no worries. 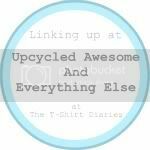 Since we are just about done Upcycled Awesome will be Upcycled Awesome and Everything else all in one linky party. Post what you want, have fun, and spread the love by commenting on fellow posters content! It's easy and fast. Let's end this party in style and go ahead and link up as many items as possible.